For your Fall Family Fun look no further than Mayfield Corn Maze & Pumpkin Patch! You’ll want to bring the whole family out to challenge yourselves to our THREE Corn Mazes, with twists and turns and plenty of opportunity for fun, laughs and loads of picture-worthy memories. 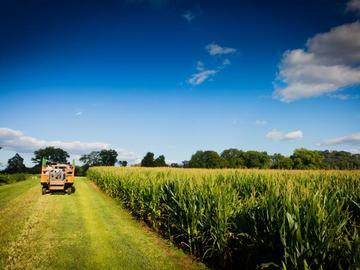 Our Corn Mazes cover approximately 10 acres of land each year. This is a General Admission ticket which includes the Corn Mazes, Pumpkin Patch, and Farm Attractions. Kids 2 and under receive a complimentary Admission. Kids and kids at heart from ages 3 to 93 are the same price and must have a valid ticket to enter the farm. Note: Tax and online ticketing fees NOT included. Just some of the Farm Attractions included: Corn Mazes, Hayrides to the Pumpkin Patch, Farm Animal visits, Pig Races, Jumping Pillow (aka Corn Popper), Jumping Pad, Corn Box with slides, Sand Mountain, Toddler Town, Farm Bikes, Kiddie Zip Lines, Farm Games, and lots and lots of Photo Ops. We welcome school tours, corporate events, churches, and birthday parties. All persons ages 3 to 103 are required to have a ticket for admission to Mayfield Farm.